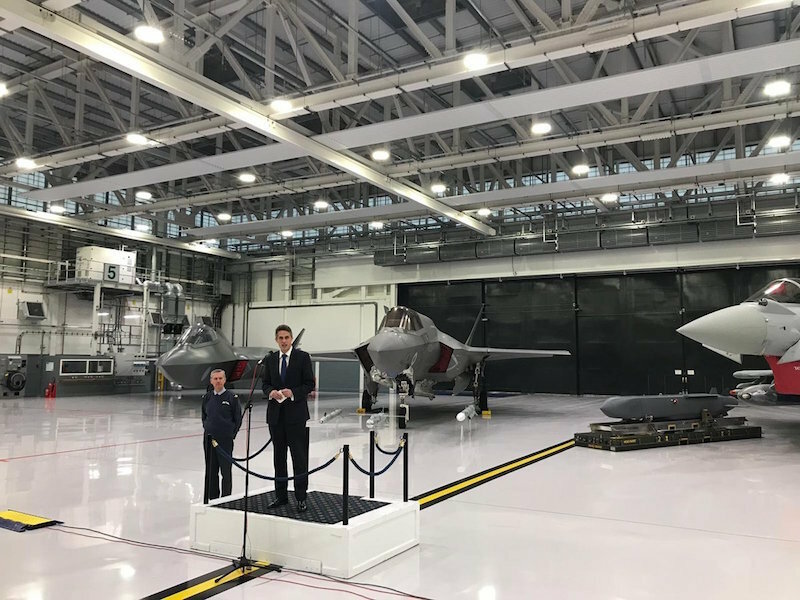 Defence Secretary Gavin Williamson has today revealed that Britain’s combat air power has reached new heights whilst speaking in a brand-new hangar displaying one-hundred years of fighter jets. Speaking at Royal Air Force (RAF) Marham, the Defence Secretary announced the UK now has nine F-35B Lightning II jets ready to be deployed on operations around the world. The F-35B Lightnings II will form the backbone of the UK’s combat air fleet alongside the Typhoon jets, which the Defence Secretary also announced have now been fitted with a state-of-the-art complex weapons suite to vastly increase its capability. Under «Project Centurion», worth £425m over the past three years, the Typhoon now has deep strike cruise missile Storm Shadow, air-to-air missile Meteor and the precision attack missile Brimstone at their disposal. It means the jets have boosted capabilities to intercept airborne missiles and strike ground based targets, seamlessly taking over from the Tornado’s attack role as it nears retirement. Completed on-time and to budget, the upgrades transform the fleet into a world-leading multi-role combat air platform for decades to come. Military engineers and personnel have worked together with hundreds of UK workers from British defence firms including BAE Systems, MBDA and Leonardo to reach the milestone. The Defence Secretary made the announcement in front of four different aircraft, in a brand-new maintenance hangar at RAF Marham, which he opened today along with a state-of-the-art new training centre. These facilities, along with resurfaced runways and new landing pads to accommodate the jet’s ability to land vertically, are a key part of the £550m being invested in the Norfolk base. Defence Secretary Gavin Williamson said: «As we bid farewell to the RAF’s first century, we are setting our sights on the next 100 years. Our nation is moving into a new era outside the EU, and our huge achievements in air capability make our commitment to a role on the world stage clear to both our allies and our enemies. The incredible F-35 jets are ready for operations, a transformed Typhoon has the power to dominate the skies into the 2040s and we continue to look even further into an ambitious future. The RAF has long shown Britain at its great and global best, and today it lifts our nation to even greater heights». The year ahead will see the F-35B Lightning II pilots and ground crew continue learning how to operate and maintain the jets in the new centre, which features state-of-the-art simulators, classrooms, and physical aircraft mock-ups. The facility provides a real-life training environment replicating the challenges that both pilots and crew will face in supporting and operating the F-35B Lightning II. Pilots from 617 Squadron, who are already based at RAF Marham, will practice flying the next generation aircraft from four full mission simulators. Having the F-35s ready for operations on time is a huge landmark in what is the biggest defence project in history, which the UK has been a leading partner in for almost 25 years. Around 150 UK personnel had been working with the jets in the US before the first batch of aircraft came to the UK last summer. Not only does the programme offer the UK a game-changing military capability, but with British industry manufacturing 15% of a global orderbook of over 3,000 jets, it supports around 25,000 UK jobs and is projected to be worth around £35bn to the national economy. The Defence Secretary made the announcement in front of four aircraft, which represent the past and future of British fighter jets. They included the Tornado, which has been in-service since 1979, making its combat debut in the 1991 Gulf War, and which will be retired later this year. Its unique capabilities have now been transferred to the Typhoon. In addition to the Typhoon and F-35B Lightning II, the Tempest concept fighter jet model was also on show. The model, which represents an example of what the UK’s future capability might look like, was unveiled last Summer at Farnborough International Air Show, when the Defence Secretary launched the nation’s Combat Air Strategy to ensure the UK remains a world-leader in the sector for years to come. The aim is then for a next-generation capability to have initial operational capability by 2035. Chief of the Air Staff Air Chief Marshal Sir Stephen Hillier said: «I am proud to confirm that the RAF’s Combat Air capability has taken yet another significant step towards the realisation of our Next Generation Air Force. With its cutting-edge stealth technology, our F-35s are now ready to deploy on operations and, alongside our combat-proven Typhoon, offer a step-change in our ability to employ air power around the world. Furthermore, the successful integration of Stormshadow, Brimstone and Meteor on Typhoon completes and enhances the transition of world-class capabilities from Tornado and allows a stalwart of the RAF’s Combat Air inventory to retire from service. The successful attainment of these milestones and the potential offered by Project TEMPEST will continue to assure the RAF’s ability to protect the nation, defend the United Kingdom’s interests and support the national prosperity agenda now and well into the future». The RAF has already trialled its Typhoon and F-35B Lightning II Forces’ interoperability. In a series of operational trials, the evidence clearly demonstrates the effectiveness of both platforms when operating alongside one another. With its larger payload and increased agility and range, the Typhoon will operate in concert with the stealthy F-35B Lightning II and its next-generation sensors, making the RAF one of the few air forces with the ability to exploit the synergy of 4th and 5th generation combat aircraft and delivering the UK a potent force equipped to counter evolving threats in the global environment. The UK is a world-leader in the combat air sector, which supports over 18,000 highly skilled jobs with a mix of skills and technologies unique in Europe. The sector delivers a turnover in excess of £6bn a year and has made up over 80% of defence exports from the UK over the last ten years.